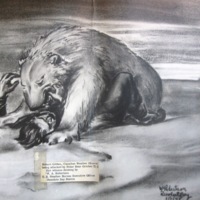 A charcoal drawing depicts a huge polar bear mauling a figure indicated by the description to be Robert Gibbons a Canadian Weather Observer. 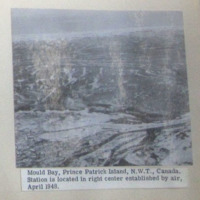 Aerial view of an almost triangular landmass jutting out into the ocean which is covered in ice. 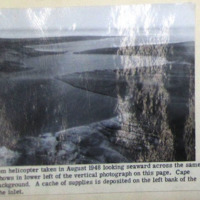 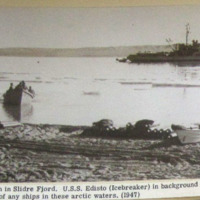 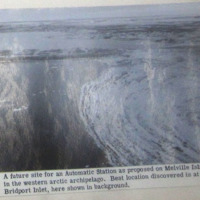 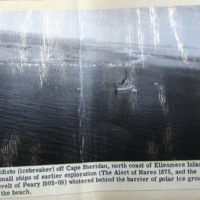 The landmass connects to the mainland at one of its points where there is a small body of water also covered with ice floes. 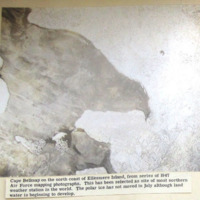 An aerial view of two landmasses close together with two areas where parts of the land jut out towards each other, creating straits and large pools of water between the two landmasses. 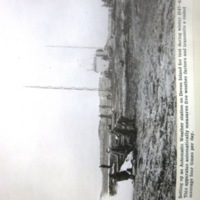 Several small, hangar-like structures are in the midground of the picture with cables trailing from them to tall pylongs surrounding them. 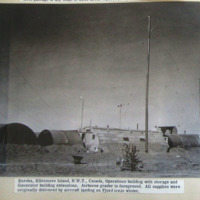 These structures are indicated to be the Operations Building, Storage and Generator building extensions. 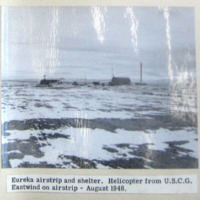 Pictured is a snow and rock dominated landscape with several pathways through the snow towards a Station in the right center of the picture.